Whether you are building a new pool or retrofitting an existing one, stone veneers will add beauty and character. You can mimic the opulent look of full, natural stone for a fraction of the price. A wide range of colours and styles gives you complete design flexibility. Many property owners in Ontario are now opting for stone veneers both for their above ground and in-ground swimming pools. 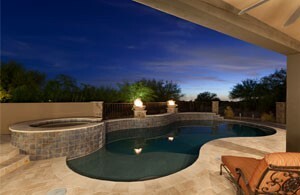 Organic feel: Stone veneers give your pool space a soothing, organic feel. Attractive patterns mimic earthy tones helping you create an oasis in your own backyard. Whether you want a warm rustic feel, a cool contemporary style or somewhere in between, you can fashion any look that you want. Lightweight and easy to install: Being lightweight and easy to install, stone veneers gives pool owners the confidence to bring their dream designs to light. Professional installation is a good choice and the cost will also be much less than putting in full, natural stone. Lasting beauty: Stone veneers have a timeless beauty which is not affected by the elements, pests or age; problems that you may face with tiles or a wooden deck. Low maintenance: Relatively easy to maintain, today’s stone veneers are engineered to stand up to daily climate changes. Whether you have a chlorinated or salt water pool, your stone veneer accents retain their character and beauty for years to come and require almost no cleaning. Enhanced property value: There is no comparing the look and feel of stone veneers to standard tile. Your investment will more than pay for itself with the admiring looks of your guests and enhanced property value at the time of resale. At Platinum Stone Veneer, we treat you to the very best products and service. Our extensive selection has something to suit every style and budget. Experienced installers ensure flawless work. Look forward to a stunning swimming pool! To learn more about installations for your swimming pool or other water features, call Platinum Stone Veneer (416) 731-8600 or request an estimate online.